36 Commonwealth is located on the south side of Commonwealth, between Arlington and Berkeley, with 34 Commonwealth to the east and 38-40 Commonwealth to the west. Click here for an index to the deeds for 36 Commonwealth. 36 Commonwealth was built for Ezra Lincoln and his wife, Phebe Maria (Blake) Lincoln. They previously had lived at 92 Pinckney. They purchased the land for 36 Commonwealth from Samuel Hooper in July of 1860 (Samuel Hooper’s July 2, 1860, deed conveying 34 Commonwealth refers to the lot to the west as “to be conveyed by me to Lincoln”) but the deed conveying the land from Samuel Hooper to Phebe Lincoln was not executed until July 7, 1862. Ezra Lincoln was a civil engineer and, from about 1862, served as Assistant United States Treasurer, headquartered at the Customs House in Boston. Ezra Lincoln died in June of 1863 and Phebe Lincoln moved soon thereafter. On December 14, 1863, 36 Commonwealth was purchased from Phebe Lincoln by Josiah Caldwell. He previously had lived at the Tremont House hotel. A former clothing merchant, Josiah Caldwell was an investor in and stock promoter of coal mines and railroads. He was unmarried. He was joined at 36 Commonwealth by Charles F. Manson, treasurer of the Franklin Coal Company, and his wife, Eliza (Cutler) Manson. They continued to live there in 1865, but moved thereafter. Josiah Caldwell moved back to the Tremont House at about this time. He married in October of 1866 to Anita E. Smith and by 1869 they were living at 224 Beacon while building a new home at the southeast corner of Marlborough at 299 Berkeley. Josiah Caldwell was a principal promoter of the Little Rock and Fort Smith Railroad in the late 1860s and early 1870s. In March of 1871, a strike by unpaid workers caused the railroad to default on bonds it had sold in 1869. The bond default also indirectly led to US Representative James G. Blaine losing the 1876 Republican presidential nomination. It was alleged that Josiah Caldwell had provided bonds in the railroad to Blaine, who was Speaker of the House, in exchange for his support of granting rights of way to the new railroad, and that the Speaker subsequently prevailed on several other railroads to buy the bonds from him at an inflated price before the default. On July 21, 1865, 36 Commonwealth was acquired from Josiah Caldwell by wholesale dry goods merchant Josiah Bardwell. He and his wife, Mary (Perkins) Bardwell, lived at 2 Joy Street. On September 9, 1866, 36 Commonwealth was acquired from Josiah Bardwell by the estate of attorney Augustus Henry Fiske, who had died in March of 1864. It became the home of his widow, Hannah Rogers (Bradford) Fiske. She also maintained a home in Weston. Five of Augustus and Hannah Fiske’s eight surviving children lived with her at 36 Commonwealth and in Weston: Margaret Fiske, Sarah Ripley (Fiske) Willard (the widow of Major Sidney Willard, who was killed at the Battle of Fredericksburg in 1862), Charles Henry Fiske, George Fiske, and Andrew Fiske. By 1869, she also was joined by her son-in-law, attorney Frank Morison, the widower of her daughter, Lucy Ann (Fiske) Morison (who died in May of 1866 in Florence, Italy). And from the early 1870s, her unmarried brother, George Partridge Bradford, a teacher, also lived at 36 Commonwealth; he continued to live there in 1876, but moved to Concord soon thereafter. Charles Fiske, an attorney, married in June of 1868 to Cornelia Frothingham Robbins. They lived briefly with his mother but had moved to 241 Beacon by 1870. Cornelia Fiske died in February of 1872, and Charles Fiske and their infant son, Charles, moved back to 36 Commonwealth to live with his mother. George Fiske traveled to Europe after he graduated from Harvard in 1872. He married in January of 1873 in London to Johanna Euling and remained in Europe for several years before returning to live in Weston (he married again, in December of 1888, to Mary E. Rood). Margaret Fiske married in August of 1873 to William Watson, a professor at MIT. 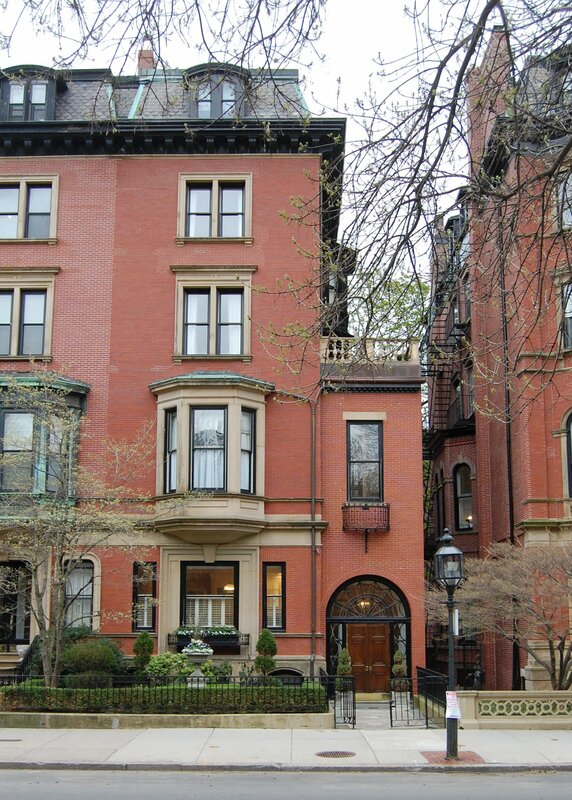 After their marriage, they lived at 73 Marlborough. In June of 1874, Sarah (Fiske) Willard remarried, to Rev. Chandler Robbins, minister of the Second Church (Unitarian), and moved to his home at 114 Marlborough. He was the father of Cornelia Robbins, the deceased wife of Sarah Willard’s brother, Charles. In April of 1878, Frank Morison remarried, to Leslie McGregor. After their marriage, they lived at 44 Chestnut with his new mother-in-law, Mary (Kent) McGregor, the widow of James McGregor. Andrew Fiske, an attorney, married in June of 1878 to Gertrude Hubbard Horsford. After their marriage, they lived at 267 Clarendon. Hannah Fiske died in October of 1880. Charles Fiske continued to live with her until her death, after which he moved to the Hotel Vendôme. After Hannah Fiske’s death, her daughter, Sarah (Fiske) Willard Robbins, acquired 36 Commonwealth through two transactions, one on April 16, 1881, with her siblings, and the other on May 10, 1881, with Adelaide P. (Frost) Fiske, the widow of her deceased brother, Edward, and guardian of their minor children, Edward and Susan. Chandler and Sarah Robbins continued to live at 114 Marlborough and leased 36 Commonwealth to others. During the 1881-1882 winter season, 36 Commonwealth was the home of wholesale dry goods merchant and former East India merchant George Richards Minot and his wife, Harriet (Jackson) Minot. They also maintained a home, Woodbourne, in West Roxbury. By the 1882-1883 season, they had moved from 36 Commonwealth, probably to their home in West Roxbury, where George Minot died in December of 1893. Before his death, the Minots had begun construction of a new home at 245 Marlborough. When it was completed, Harriet Minot moved there and continued to live there until her death in December of 1886. By the 1882-1883 winter season, 36 Commonwealth was the home of three families: Eugene Henry Sampson, treasurer of Everett Mills (textile manufacturers), and his wife, Martha (Gilbert) Sampson; Henry Taft Wing, a dealer in wool shoddy, and his wife, Marion M. (Sanford) Wing; and Walter Potter, a banker and dealer in commercial paper, and his wife, Helen M. (Fogg) Potter. 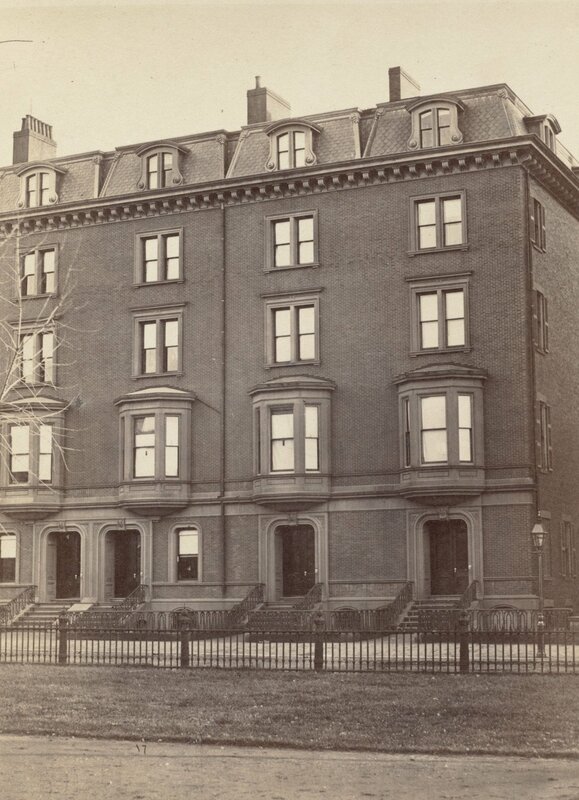 The Sampsons previously had lived at 39 Union Park, the Wings had lived at 214 Columbus, and the Potters had lived at the Hotel Bristol (northwest corner of Clarendon and Boylston). They all continued to live at 36 Commonwealth during the 1883-1884 season. By 1885, the Sampsons and the Wings had moved to 16 Newbury (the Sampsons moved to 134 Marlborough by the 1886-1887 season), and the Potters had moved to 18 Commonwealth. 36 Commonwealth was not listed in the 1885 Blue Book. During the 1885-1886 winter season, 36 Commonwealth was the home of Mlle. Gabrielle de la Motte. She was a music teacher and director of the Sanctuary Choir at the Catholic Cathedral of the Holy Cross on Washington Street. She previously had lived at 9 Malden, and had resumed living there by 1887. By the 1886-1887 winter season, 38 Commonwealth was the home of Miss M. Louise Putnam, a teacher. She previously had lived at 68 Marlborough, where she had operated a private school for young ladies. She continued to live at 36 Commonwealth in 1889, but had moved by 1890. On March 15, 1890, 36 Commonwealth was purchased from Sarah Robbins by Mrs. Grace Morris (Cary) Kuhn, the widow of Hartman Kuhn, and her son, Hamilton Kuhn, a lawyer. They also maintained a home in Lenox. At about the same time, her unmarried sisters, Ellen and Anne Cary, moved to 34 Commonwealth. 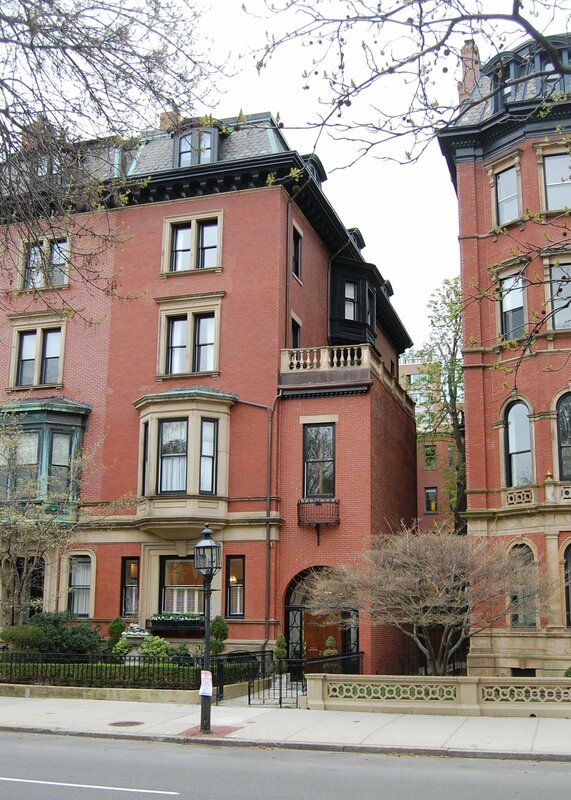 They all previously had lived at 64 Beacon (which had been the home of their parents, who had died in the 1880s) with their sister-in-law, Lena (Laight) Cary, the widow of William F. Cary, Jr. (who had died in September of 1880). After purchasing 36 Commonwealth, Grace Kuhn retained architect Arthur Little (of Little and Browne) to remodel the house. The original entrance was converted into a window and a two-story addition on the west side of the house, with a street level entry, was added at this time (it is not shown on the 1890 Bromley map, but is shown on the 1895 map). Hamilton Kuhn died in January of 1902. Grace Kuhn continued to live at 36 Commonwealth and in Lenox until her death in October of 1908. In his will, Hamilton Kuhn had left half of his one-half interest in 36 Commonwealth to his mother and the other half divided among several cousins. When Grace Kuhn died, she left three-fourths of her interest in the property to her sister, Ellen Cary, and one-eighth each to her nephew, Hamilton W. Cary, and her niece, Catherine C. Cary. Between July and September of 1909, real estate dealers James Sumner Draper acquired the interests of the Kuhn devisees in 36 Commonwealth, and on September 30, 1909, he sold the property to the estate of Samuel Cabot. By the 1909-1910 winter season, 36 Commonwealth was the home of Samuel Cabot’s son-in-law and daughter, Henry Lyman and Elizabeth (Cabot) Lyman. They had married in December of 1908. Prior to their marriage, she had lived with her widowed mother, Helen Augusta (Nichols) Cabot, at 109 Commonwealth. Originally a businessman, Henry Lyman entered Harvard Medical School and graduated in 1912. He subsequently became a physician and biological research chemist at Harvard. By 1912, the Lymans had been joined at 36 Commonwealth by Elizabeth Lyman’s uncle, Dr. Arthur Tracy Cabot, and his wife, Susan (Shattuck) Cabot. They previously had lived at 3 Marlborough. They also maintained a home in Canton. Arthur Cabot was a surgeon specializing in genito-urology. He died in November of 1912. Susan Cabot continued to live at 36 Commonwealth with the Lymans during the 1914-1915 winter season, but moved soon thereafter to 109 Commonwealth to live with her sister-in-law (Elizabeth Lyman’s mother), Helen (Nichols) Cabot. Helen Cabot died in May of 1917, and by the 1917-1918 winter season, Henry and Elizabeth Lyman had moved to 109 Commonwealth. 36 Commonwealth was not listed in the 1918 Blue Book. During the 1918-1919 winter season, 36 Commonwealth was the home of Edward Williams Atkinson, a dealer in textile machinery, and his wife, Ellen Forbes (Russell) Atkinson. 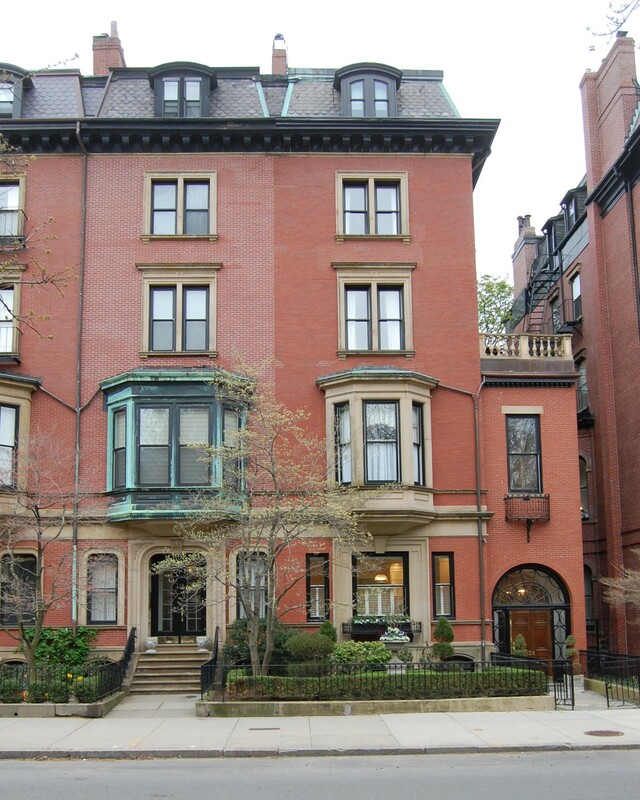 Their primary residence was in Chestnut Hill, where they were living again in 1920; they leased 36 Commonwealth for the season because their daughter, Mary Forbes Atkinson, was a debutante that year. By the 1919-1920 winter season, 36 Commonwealth had become the home of ornithologist John Eliot Thayer and his wife, Evelyn Duncan (Forbes) Thayer. They continued to live there during the 1920-1921 season. On May 27, 1921, 36 Commonwealth was purchased from the estate of Samuel Cabot by investment banker Walter Hunnewell, Jr. He and his wife, Minna Cornelia (Lyman) Hunnewell, made it their Boston home. They previously had lived at 173 Beacon. They also maintained a home in Wellesley. The Hunnewells continued to live at 36 Commonwealth until about 1940, when they made Wellesley their home. 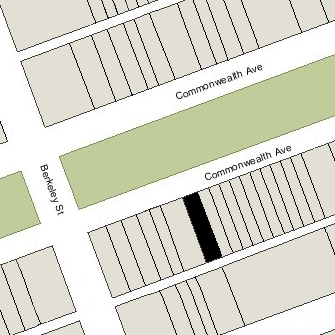 36 Commonwealth was shown as vacant in the 1941-1943 City Directories. On December 28, 1942, 36 Commonwealth was acquired from Walter Hunnewell by Edward A. Hurley, Massachusetts state treasurer of the Knights of Columbus. On the same day, he transferred the property to the Columbus Home Corporation. In January of 1943, the Knights of Columbus filed for (and subsequently received) permission to convert it from a single-family dwelling into a clubhouse for service men, with social and recreation rooms on the second and third floors, and dormitories for soldiers on the fourth and fifth floors. The center continued to operate at 36 Commonwealth until May of 1946. In September of 1946, Archbishop Cushing announced that 36 Commonwealth would become the headquarters of the Catholic Youth Organization. On December 2, 1946, the Columbus Home Corporation transferred 36 Commonwealth to the Roman Catholic Archdiocese of Boston. That same month, the Archdiocese applied for (and subsequently received) permission to convert it into offices and residences for priests. The Catholic Youth Organization headquarters was opened in October of 1947. By January of 1951, 36 Commonwealth had become the convent of the Medical Missionaries of Mary. The Medical Missionaries of Mary remained there until May of 1952, when they moved to a new convent in Winchester and 36 Commonwealth became the convent of the Sisters of St. Martha. On May 27, 1954, the Archdiocese transferred the property to the Sisters of Saint Martha. They remained at 36 Commonwealth until the mid-1980s, and on June 12, 1987, they transferred the property back to the Archbishop. In February of 1988, the Archdiocese applied for (and subsequently received) permission to convert the property back into a single-family dwelling. On May 18, 1988, 36 Commonwealth was purchased by Farshid Banani, trustee of the Dara Nominee Trust. In November of 1988, he applied for (and subsequently received) permission to convert the property into a two-family dwelling. It was probably at this time that windows were added on both sides of the window that had replaced the original entrance to the house in about 1890.